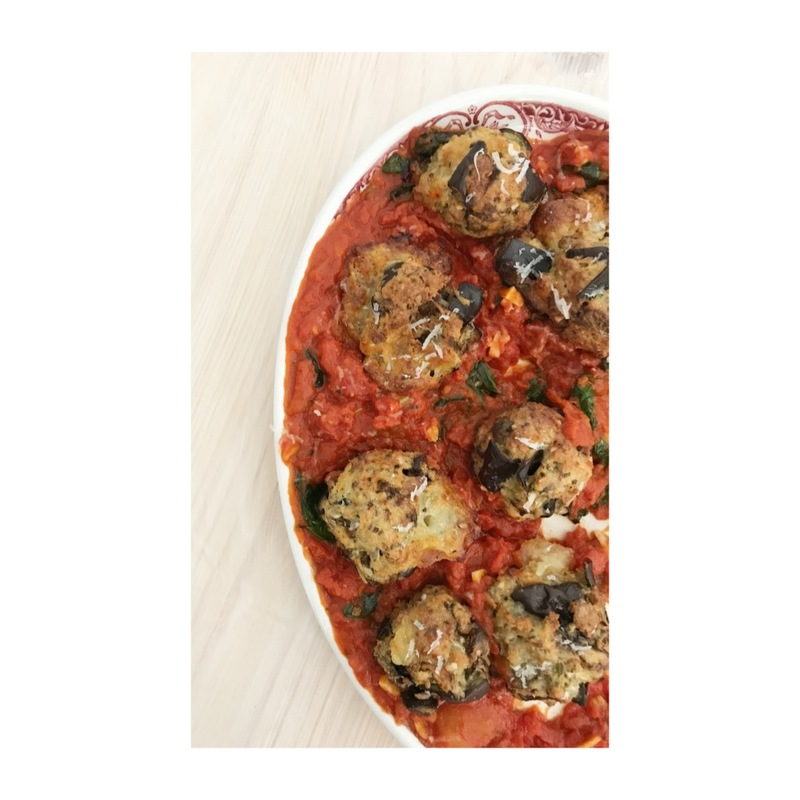 Meatless meatballs, aubergine balls, vegetarian balls – I struggled a bit to name this recipe. Anyhow, I’ve settled on eggplant polpette. Eggplant because I taught it first in my cooking classes in California, polpette because, well, ‘balls’ is only ever going to get one reaction. There are some recipes that I teach that need a bit of hard sell and this is one. People often sit, arms closed, when I introduce this in a class. But once they taste the finished dish, and see how easy it is, those arms drop to grab seconds. This is one of the recipes that I get the most pictures of after class. I wish I had a dollar for every person who has said their child/partner doesn’t eat aubergine but has then gobbled these up. The main reason for those closed arms is that so many people have very fixed ideas about aubergine. So if you’re not keen, know that there is nothing squidgy or slimy about the aubergine in the recipe – it is included to give body and an almost meatiness to the finished eggplant polpette. Eggplant polpette is the perfect meat-free Monday recipe and can be made ahead of time. I usually roast the diced aubergines earlier in the week, while I’m cooking something else in the oven. Then I either freeze them or keep them in the fridge ready to add to the polpette later in the week. If you do this, the whole meal can be made in 25 minutes. While you’ve got pans to wash, you may as well make a double or triple batch of the sauce and freeze it in individual servings for speedy dinners in future. It is lovely stirred through pasta or as a sauce for fish or chicken You can even thin it with some vegetable stock and puree it with drained white beans for a speedy tomato soup. This is not the place for panko or dried breadcrumbs. It is so easy, and frugal to make you own breadcrumbs, use day old bread and break it into chunks. Place in a food processor and pulse until it turns to breadcrumbs. Get in the habit of keeping ends of loaves, breaking them into chunks and then freezing them. Then you’ll be able to make breadcrumbs every few weeks, or use the chunks as croutons. Breadcrumbs can be re-frozen and used from frozen in most dishes. If you are gluten-free, use good gluten-free bread. 75g (Two thirds of a cup) freshly grated Parmesan – buy vegetarian Italian hard cheese if cooking for vegetarians as regular Parmesan contains rennet. Pre-heat the oven to 180°C (160°C fan) 350°F. Cut the stalk end off the aubergine. Lay it long ways and cut a thin slice off the bottom to give a sturdy base. Cut into half inch slices. Turn the stack of slices over and cut them into half inch fingers. Turn the stack again and cut across to create half inch cubes. Line a baking sheet with parchment and lay the cubes on top. Scatter with oil and use your hands to distribute it evenly. Roast for 30 minutes. Leave the oven at this temperature to cook the polpette shortly. This can be done 4 days ahead of time – see note above. Add the breadcrumbs to a large bowl along with the finely grated Parmesan, zest of the lemon, finely chopped rosemary leaves and around half a teaspoon of freshly ground black pepper. Drain the mozzarella and cut it into very small cubes. Add to the breadcrumbs. Add the cooked aubergine to the bowl and stir. Then crack both eggs in and mix well. Take handfuls of the mixture and gently squeeze into golf-ball-sized polpette. I usually get 14 polpette from this mixture. At this stage the uncooked polpette can be left in the fridge for a day. Lay the eggplant polpette on the roasting tray you used to cook the aubergine, an inch apart. Drizzle with a little oil and cook in the oven for 20 minutes, at the same temperature you cooked the aubergine originally – 180°C (160°C fan) 350°F. The polpette are ready when they are golden brown and – this is key, the mozzarella has started to ooze onto the tray and those puddles of melted cheese have turned dark golden brown. If they are still pale, leave them for another 5 minutes. You will fight over these crispy cheese puddles. Heat a tablespoon of oil in a saucepan on a medium heat and add the sliced garlic and finely sliced basil stalks. Set the leaves aside for later. Cook for 1-2 minutes until it is starting to turn golden. Add the tomatoes, butter, and the Parmesan rind, along with a big pinch of sea salt and freshly ground pepper. Bring to the boil, then drop to a simmer and cook with a lid on for 20 minutes. After 20 minutes, take off the heat. Stir in the whole basil leaves. Taste and add red wine vinegar, sea salt and black pepper. Scoop the tomato sauce into a shallow bowl or platter and place the eggplant polpette on top. Push down slightly so they are half-submerged. Sprinkle with Parmesan and serve with a green salad and crusty bread to dunk. Leftovers can be kept in the fridge for 3 days before being eaten at room temperature or reheated, in the sauce, in a medium oven. Find all my mid-week dinners and vegetarian recipes. Other aubergine/eggplant recipes.